Confessions of a Hungry Woman: On Rhodium and Rings. On Wine and Whine. When Jacques and I got engaged I sold my Kruger Rand to pay for the gold of my ring. I also had several links from a gold chain removed so that the jeweler could use it to make a wedding band for Jacques. (The chain, sadly, is now uncomfortably short and I seldom wear it.) We did what we had to do. He had just finished studying and there wasn't much money. Having discovered how horribly expensive platinum was we chose white gold. And tiny (tiny) diamonds. But the design was great. And the inscription even better. Almost 14 years later I still love the ring and I never take it off. Ok I only take it off once a year when I have it Rhodium-plated. Rhodium, if like me, you never knew, is a rare, extremely valuable, silver white member of the platinum group. It is also electroplated on white gold to give it that reflective shiny surface. This is known in the industry as 'Rhodium flashing.' Whatever. It annoys me. And had I known I would need to do this, I would have asked for a silver ring. So I've decided to stop with the Rhodium flashing malarky. It's silly and unnecessary. The ring I wear is shows signs of wear as do I. Relationships (and life) are seldom easy and we bear the scars. We should do it without shame, without wanting to cover up. After almost 13 years of marriage, I proud and grateful that we've come this far. I don't need a shiny ring. I'm grateful that I have this one. With this inscription. 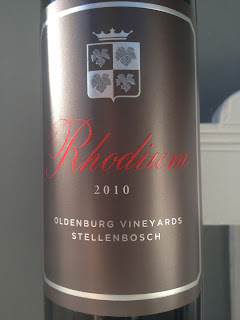 Which brings me to an altogether nicer form of Rhodium. 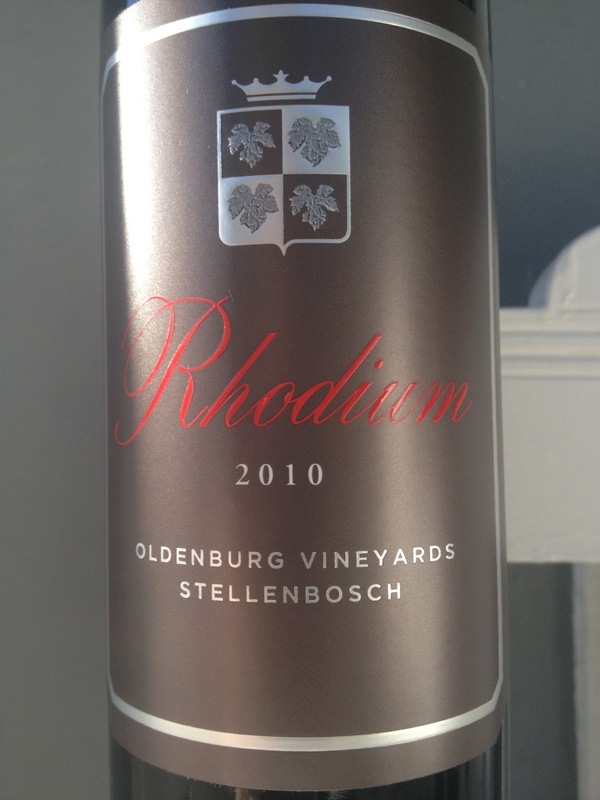 The beautiful red Rhodium 2010 (made from 50% Merlot, 10%Malbec and 40% Cabernet Franc and selling for R330.00) from The Oldenburg Vineyards. I tasted it at a wonderful wine lunch where I felt decidedly out of my depth with all the great wine writers who are seriously knowledgeable about wine. I don't have that sort of knowledge, but I do know what I like. And I like this red. I like it a lot. Micheal Olivier knows a lot about wine and it pleases me that I'm right in liking it. So if you don't trust my opinion, here is his. Anyway, the wine is seriously good (more than worthy of being named after a (very) precious metal, it's the sort of wine you want to drink while lying in front of the fire with a lover. It's smooth and calls for sensuality and I've been saving it up for a special occasion. So having taken the photo a while ago for this post, I put it away, knowing that come the first rainy weekend, I would lure Jacques away from his books, banish the dogs to the other room and share this rather special wine with him in front of the fire. Last night was the night. But the wine was gone! Missing! As in bloody disappeared. Jacques swears he never touched it, but I suspect he gave it away to one of his mates. So if one of his friends who may have been given it, reads well I hope your Saturday night temperatures were less frosty than ours.